"It's a clean break," Washington manager Davey Johnson said after the Nationals' 9-3 loss. "He's going to be out for a while." 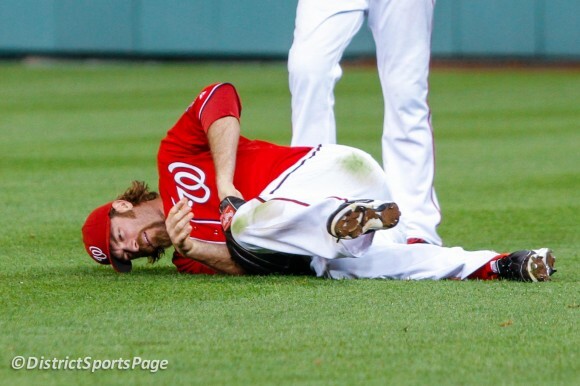 Johnson said Werth will see a specialist to evaluate the injury. Werth was injured in the sixth inning. The right fielder's glove got caught underneath him and he bent his wrist backward trying to grab Placido Polanco's sinking liner. Werth stayed on the ground briefly before throwing the ball back to the infield. He walked off holding his left wrist. Werth wasn't available to speak to the media after the game. This is only the latest in a string of injuries that have already hit the Nationals this season. Michael Morse, slated to be the team's cleanup hitter, hasn't played because of an injured back muscle. Third baseman Ryan Zimmerman has been on the disabled list with a shoulder injury, and fill-in cleanup hitter Adam LaRoche has missed the past four games because of a sore right side muscle. Zimmerman and LaRoche are hoping to return for Washington's next game, Tuesday night at Pittsburgh. "All of a sudden we seem to be getting a little more healthy and then boom, another one of our main guys goes down," Johnson said. "We've dealt with it before we'll deal with it again. We're not alone. It seems like it's rampant right now. It's a tough blow." Werth missed the entire 2006 season after an injury to his left wrist which placed his career in jeopardy. He broke the wrist in spring training 2005 with the Dodgers and played 102 games that season before undergoing surgery to repair a torn ligament in the wrist. He joined Philadelphia in 2007 and became an All-Star outfielder in his four seasons there before signing a $126 million, seven-year deal with the Nationals before the 2011 season. The injury took some of the luster off another spectacular performance by 19-year-old Bryce Harper, who went 2 for 3 with a double and stole home in the first inning. "That's really bad," Harper said. "That's a big loss for us." Zimmerman took batting practice on the field before Sunday's game and said he felt good. Now, instead of building toward a full lineup Zimmerman's return will just plug the hole left by Werth's injury. "We're a resilient team," Zimmerman said. "It's frustrating. Anytime anyone gets hurt it's tough, but it's part of the deal. It's a long season and we're going to have to go through adversity this team has the talent and the capability to do that." LaRoche was also looking forward to joining a near-full strength lineup until Werth's injury. "Never a good time to lose anybody, especially a guy in the heart of your lineup," LaRoche said. "We were looking forward to this next series, this next week, being together again. Now we're obviously short another big bat and a big part of this team. So, time for everybody to step up and make up for it as much as we can. Nationals starter Jordan Zimmermann (1-3) took the loss Sunday for the NL East-leading Nationals, giving up three runs and seven hits. His disappointment over his night was matched by his concern for his latest injured teammate.